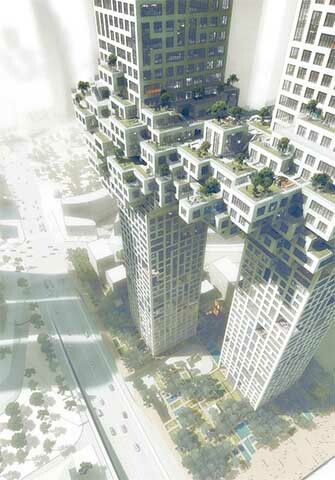 Dutch architectural firm MVRDV has a new take on high-rise residential towers – the asymmetrical and distinctly intriguing twin-tower complex known as The Cloud, due for completion in the South Korean capital of Seoul by 2015. 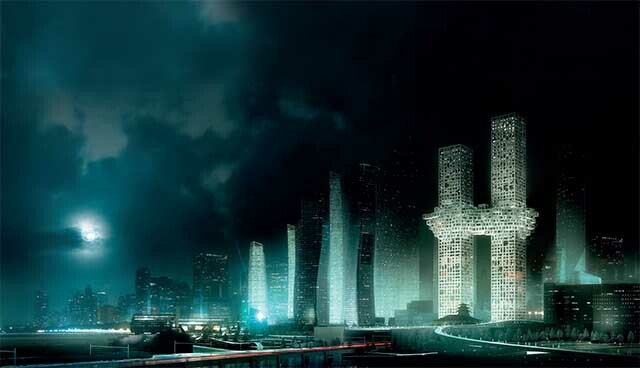 The connected towers will be built at the entrance of the ambitious Yongsan Dreamhub project, masterminded by Studio Libeskind. The 54-storey southern tower reaches a height of 260 m and the 60-storey northern tower tops that by 40 m. About halfway up, at the level of the 27th floor, the two towers are connected by a visually striking 10-storey cluster of apartments, many featuring roof gardens. On top of the building is a series of public and private outside spaces, patios, decks, gardens and pools. Interestingly, some people made an uncomfortable connection between this project and the tragic events of 9/11, prompting the architects to issue a statement in which they apologised for any hurt feelings and explained that ‘it was not our intention to create an image resembling the attacks; nor did we see the resemblance during the design process’.